Saltwater aquariums are fantastic, providing the opportunity to have a range of aquatic live in your home that just isn’t possible with a fresh water aquarium. However, such habitats require specific conditions, knowledge, and a certain amount of upkeep and maintenance. One of the main concerns with saltwater tanks is the build-up of organics waste, which can be detrimental to the fish and other life that is within the aquarium. One of the best ways to deal with such waste is with a protein skimmer. But, with so many different types and sizes to choose from, knowing which is the right one for your aquarium can be difficult. Our panel of aquatic experts have created a list of the best protein skimmers to help you make the right decision. 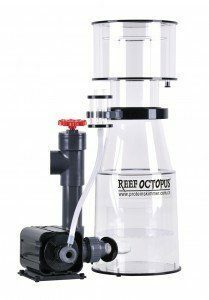 The Classic 11-INT Needle Wheel Protein Skimmer from Reef Octopus is perfect for use in small aquariums that have limited sump space. The ultra-compact design has a cast acrylic body construction and runs through its own ‘air shredding’ Aquatrance pump. The pump produces the perfect mix of air and water for optimal waste removal, while a vented wedge offers precision control. Cleaned water exits below the water level, meaning the whole operation is much quieted than it is with some protein skimmers. Additionally, water is drawn directly from the sump, meaning that a feed pump is not required. It is also easy to disassembly for maintenance. 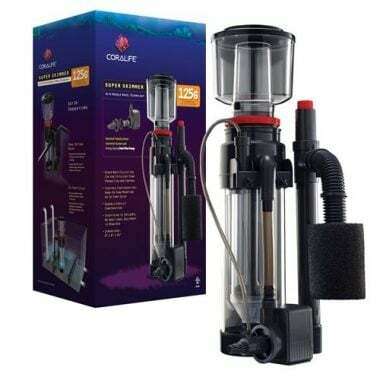 The Super Skimmer with Pump from Coralife is suitable for use in aquariums from 65 gallons to 220 gallons. Its adaptable design means that it can be used either in-sump or on a mounting bracket on the side of the aquarium. The patented needle-wheel impeller and aspirating venturi create a high performing skimmer without excessive power demands. Fine proteins and organic compounds are attracted to micro bubbles within the reaction chamber and are deposited in the collection cup for easy removal. A low profile, compact protein skimmer, the 115 Mini from Aquatic Life is ideal for nano-tanks up to 30 gallons. It can be mounted on the inside of the tank with mounting bracket and suction cups. However, it is also the right fit for most rear overflow or filtration compartments. The 8-watt needle-wheel impeller pump maximizes contact between air and water and offers effective and efficient organic waste removal. The skimmer is easy to clean, and a built-in channel hides the grounded power cord for safety. 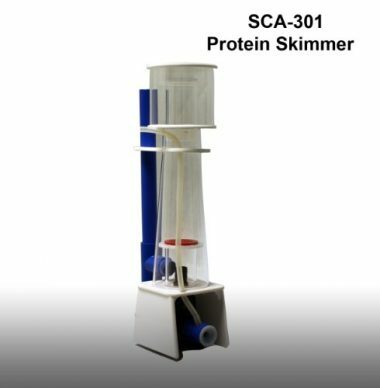 Designed to work with tanks up to 65 gallons, the SCA-301 Protein Skimmer from SC Aquariums includes 28-watt pump and air silencer. This makes the skimmer one of the quietest available. The easy assembly pump can be secured to the base of the aquarium using suction cups, which are included. It then sits under the body of the skimmer, allowing the output to jet upwards into the chamber to create the necessary micro-bubbles. The collection cup is removable for easy cleaning and maintenance and includes a drain tube. The tube funnels away excess moisture and skimmate if weekly cleaning is missed for any reason. The Bubble Magus BM-Curve 5 Protein Skimmer is designed for use in salt water aquariums up to 140 gallons. It is extremely efficient and works with a Needle-Wheel pump system. The skimmer is very quiet, creating next to no noise when working. It is also easy to set up, adjust, and clean with its quick-release collection cup; the skimmer also has a small footprint, particularly in relation to its power. 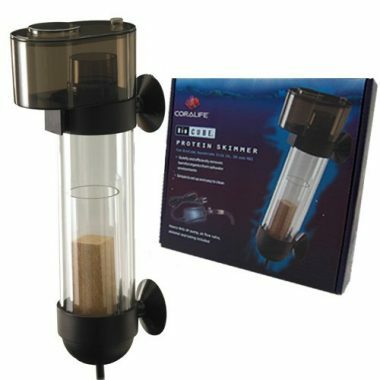 The Coralife BioCube Protein Skimmer for Aquarium Filter is specifically designed to fit 14 and 29-gallon BioCubes. It fits directly into the built-in filtration system situated at the back of the BioCube. The skimmer is quiet and efficient at removing harmful organic matter from saltwater aquarium environments. It is easy to set up and simple to clean, making it ideal for those new to keeping saltwater aquariums. 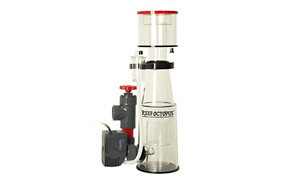 The air flow valve, skimmer, tubing, and heavy-duty air pump are all included in the kit. 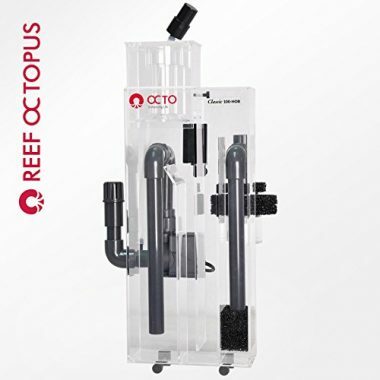 If you are looking for an easy to operate and install hang-on skimmer, then the Reef Octopus Classic 100-HOB is perfect. The skimmer is easily mounted on the back wall of the tank, the pump is then put in place externally under the skimmer, before adjusting the intake strainer; then you are ready to start skimming. The unique design takes up much less room in the aquarium and creates less heat to water exchange. Created from high-quality acrylic, the skimmer uses an Aquatrance pinwheel pump, which is very efficient and produces the perfect mix of air and water for optimal waste removal. The skimmer is designed for use in aquariums up to 105 gallons. 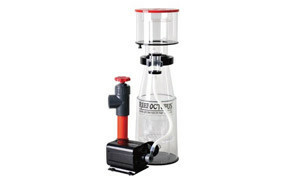 The AC20287 Octopus Needle Wheel Skimmer by Coral Vue Technology is an easy to use in-sump skimmer designed for use in tanks up to 210 gallons, it uses an efficient 6-inch needle wheel skimmer for top-quality performance. 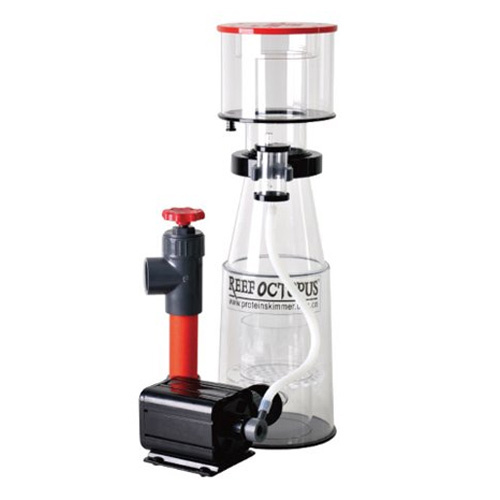 The gate valve offers easy water level adjustments, while the 4-inch cone neck provides easy transition of proteins from the bubbles into the collection cup. The cup itself is easy clean with a quick-release neck. Choosing the right protein skimmer for your saltwater aquarium is not just about knowing which the best products are, it is also about knowing why they are the best. In this part of the buying guide we explore protein skimmers in more detail; looking at what you need to consider when buying a skimmer for your aquarium, what the benefits are of a skimmer, and the different types that are available. Additionally, we answer some of the most frequently asked questions about these important aquarium devices. When considering the cost of a protein skimmer, it is not just the initial outlay that is important. There are also the ongoing costs to budget for. Skimmers use pumps, which in turn require electricity. The amount of electricity, and therefore the level of cost, depends on energy requirements of the pump. The more energy it requires, the more electricity it will use. Check the wattage and efficiency of any pump you are considering. The size of the skimmer you require is dependent firstly on the size of the aquarium tank that you have. Water level is also a consideration as is the type of skimmer that you are considering. You need to consider a range of questions before you settle on the right size. Will your skimmer hang off the back of your tank or sit in a sump? If your skimmer is to work with a sump, what size footprint will it accommodate? How much head room (space above the tank) do you have to accommodate a skimmer? 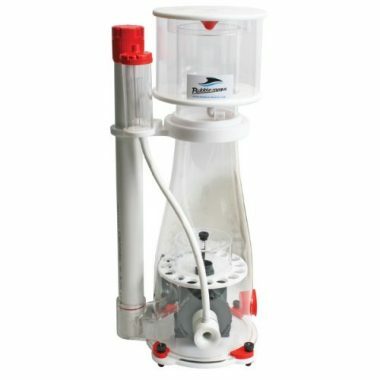 If the skimmer is outside of the sump, does it require any additional or special plumbing? To work the skimmer needs to be supplied with air and water, this is the job of the pump. If the pump is not strong enough for the task at hand, then the skimmer will work slowly and ineffectively. The strength of the skimmer is directly related to the water flow that is delivered to it in relation to the volume of the aquarium. The amount of air that is pump through is important for the formation of the bubbles. If the pump is pumping too much water in relation to air, the air bubbles do not have enough time to remove the proteins and other organic waste matter for the water. The result of this is organic waste returning to the aquarium, rather than being collected for removal. The size of the bubbles produced by the skimmer affect the efficiency of the unit. Smaller bubbles are more efficient, the more efficiently it works. Similarly, you want to produce as many bubbles as possible as this increases the surface area for the proteins to attach to. The main benefit of protein skimming is that it removes small particles of organic waste, such as food waste and other proteins from the aquarium habitat. This results in an oxygen rich environment and improves the health and survival rate of the fish in the aquarium. Using a skimmer also helps to remove nitrates and other materials that can easily result in further breakdown and lead to the appearance algae or encourage it to spread. If not dealt with early, algae can be extremely difficult to control in saltwater aquariums, so using a skimmer to help prevent it appearing in the first place is always the best course of action. Dirt build-up in an aquarium environment can also lead to issues and affect the health of aquatic life. Dirt can cause the water to become cloudy and result in not enough light penetrating the water. A skimmer helps clear cloudy water and restores it to the optimal condition for the marine life within the aquarium. If organic waste compounds are left to dissolve within the tank they can create unstable pH levels. If they become unfavorable for the marine life within the tank, it can have a detrimental effect on the health of the fish and other animals. An effective protein skimmer helps to maintain stable pH levels and supports the health and wellbeing of the occupants of the aquarium. 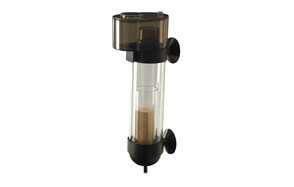 There are several different types of protein skimmers for you to choose from. The type that is right for you depends on a number of factors including the size and type of aquatic set up you have or are considering. The most common types of skimmers are hang on skimmers, in-tank skimmers, in-sump skimmers, and external protein skimmers. This type of skimmer is designed to hang on the back of the aquarium. They are a good choice for aquariums that do not have a sump. They generally attach with suction cups and reduce the space required inside the tank. In tank skimmers are generally compact in size, so they can be placed in the tank without greatly reducing the space needed by the marine life. Where the right size in tank skimmer is chosen for the tank they can be an effective choice. If you have a sump in your tank, then this type of skimmer can be integrated into it. It is important to consider the footprint of the skimmer to ensure it fits the sump you have. These are situated outside the aquarium and require additional plumbing. The water is fed into the skimmer, where it is cleaned and then returned to the aquarium. As well as these four basic types, there are also different internal workings to consider. Generally, skimmers operate as either co-current flow or counter current flow. This is one of the oldest forms of skimming where pressurized air pushes through the diffuser to produce a great quantity of micro bubbles. While an effective and economical choice it is a higher maintenance system than other more modern approaches. The air stone is generally, an oblong block of wood that has been partially hollowed. It is positioned at the base of a water column. Water is then pumped into the column and passes the rising bubbles to return to the tank. Such systems are not suitable for small home aquariums as to get the required contact time with the bubbles the units need to be several feet in height. A venturi pump is used to create bubbles in a water stream. Water from the aquarium is pushed through the venturi, where small bubbles are added, before it enters the body of the skimmer body. The compactness and efficiency of this method makes it popular with many aquarium owners. However, the venturi pump design is most often incorporated a more complex design, rather than being used as a stand-alone design. These systems are more effective and efficient than co-current flow systems, which is why those on our best protein skimmer list use this approach. In counter-current systems, air is forced into the system under pressure and moves against the flow of the water for a while before it rises towards the collection cup. The effectiveness of this type of system comes from the longer period of contact between the bubbles and the water. Examples of counter-current systems include the aspirating skimmer. Aspirating skimmers include those that use a pinwheel or needle wheel impeller. Pin wheel designs have impellers that consist of a disk with pins that are mounted at 90-dregrees to a disk and parallel to a rotor. A needle wheel impeller consists of a series of pins that project from a central axis perpendicularly to the rotor. In both cases the impeller shreds or chops the air, which is introduced by either an external pump or a venturi apparatus. This motion creates micro-bubbles. Such skimmers are very popular with owners of home aquariums and work well with small tanks as they are compact, quiet, and easy to set up. They have lower power requirements than other skimmer setups because the pump is pushing a mix of water and air. Q: What is a protein skimmer? A: A protein skimmer is a device that is added to a saltwater aquarium to remove organic waste compounds, including food waste, from the water. In doing this it improves the quality of the water and creates the ideal environment for the marine life within the aquarium. Q: How does a protein skimmer work? A: A protein skimmer works by creating micro bubbles that attract the dissolved protein particles. The resulting foam is pushed into a collection chamber or cup where it can be safely removed from the aquarium environment. Q: Where should I place my protein skimmer? A: Your protein skimmer should be the first step in your filtration process. If you use an in-sump system, then its placement depends on where your sump is situated. A hang on system should be placed at the back of the aquarium at the correct water level for your specific system. You should always check the manufacturers guide for proper placement of your specific make and model. Q: How to adjust protein skimmer? A: Once you have the right skimmer for your aquarium set up, you need to determine the depth at which it should be placed. Use your manufacturers guide to achieve this as different skimmers have their own specific requirements. Next, allow the skimmer to fill with water and connect it to an electrical outlet. 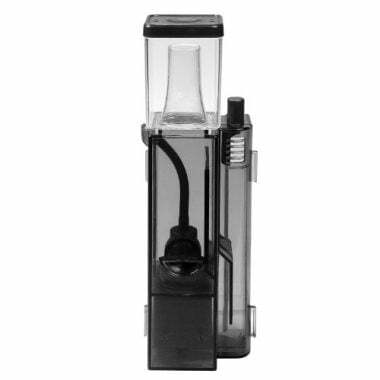 The best skimmers have an adjustable valve that allows you to vary the amount of air that enters the system. However, most experts recommend that you run the skimmer for a few days without adjusting the valve to let it settle in. After this time make small adjustments until foam is collecting in the collection chamber or cup. As the valve adjustments differ depending on the make and model, refer to your manufacturers guide for specific adjustments. Q: How to clean protein skimmer? A: Protein skimmers have a collection chamber or cup, where the protein and other waste particles are deposited in the form of foam. In most cases the cup or chamber is removable, so you can detach it from the system and empty the foam before reconnecting the cup. Generally, this needs to be done once or twice a week, however, it varies depending on the amount of skimmate and the general health of your aquarium. For more general cleaning and maintenance refer to your manufacturer’s guide so that you do not invalidate any warranty that comes with your skimmer. By following the guidance here and choosing the right protein skimmer for your saltwater aquarium, you can improve the health and longevity of your aquarium animals and enjoy watching them for years to come.